Tribune: Thanks to the generosity of Walt Konow, the depot will be relocated and preserved. As evidenced by the above photo, utility work will begin soon. The date that the depot will be moved has not been announced yet. In related news, Fleckenstein's bakery pulls out of the redevelopment deal. Construction started about 3 weeks ago, so I'm going to post pictures here as it progresses. The pictures in this post were taken during the past few months, showing the area before construction. About three years ago the Village of New Lenox bought and demolished four businesses along Route 30 for a new retail development to be built in conjunction with a new Metra station. At the time, the mayor said the old depot would be preserved and a new one would be built to the east. After a few delays in the planning process, it was announced last year that the depot would need to be demolished. The "justification" was that the utility lines to the building run under Church Street, which would be closed and torn up, so it would be too costly to relocate them. Metra, who owns the depot, also would not allow an unused building to remain so close to the tracks. 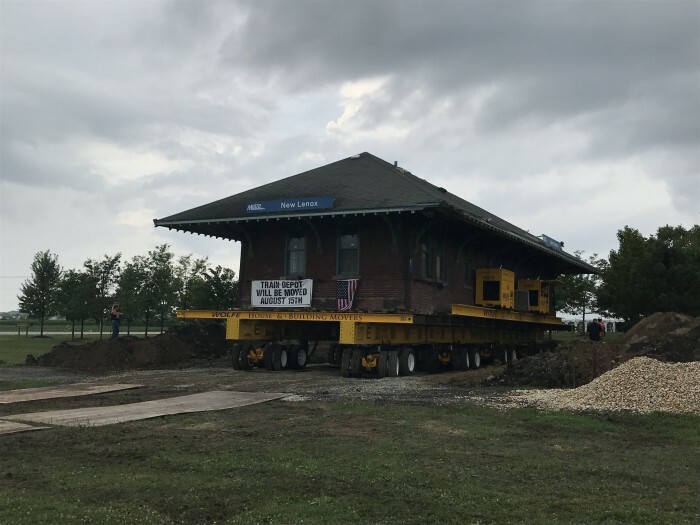 The New Lenox Area Historical Society circulated a "Save the Depot" petition, collecting over 4000 signatures, and found a donor who was willing to have the depot moved to his property. The village government then agreed not to demolish the depot while allowing construction to begin nearby. The same location in 2018. Note that Dickinson's Granary, built in 1852, still exists and is currently used for medical offices. The bridge over Hickory Creek (out of frame to right) has been replaced twice since the 1905 photo. Note the old baggage door on the east side of the building, replaced with a fixed wall with window but still distinctly visible. View to southwest from west side of depot, showing the corner of Route 30 and Cedar. The four businesses that were demolished were between Route 30 and the depot. Occupying most of the corner was the BP gas station, and Hutchins Cleaners was to its east along Church Street. View to south along Church Street from the depot. Hutchins Cleaners was on the right, close to Route 30. House of Hughes (formerly Bruns) restaurant was on the left. Looking east from corner of Route 30 and Church. House of Hughes was in the immediate foreground, Pit Stop Tavern was behind the trees. Looking west from same location. Note the old lantern (near the tree) that stood at the entrance to Hutchins. The three doors from left to right are a restroom, storage area, and ticket office. Bay window area. The New Lenox Public Library has a book exchange set up. These photos were taken 4/29/18, two weeks in to construction. View east from west end of platform. The light poles along Platform 1 were removed so the depot can be moved along this path. At the street, it will be turned 90 degrees to head north on Cedar. The remaining light poles now have wires strung between them due to the utility lines under Church Street being cut. Exit to Cedar Road closed April 30. A single lane of traffic can go past the depot to exit to Cedar Road. The parking areas closest to the building were removed. The bicycle rack was moved to the sidewalk along the south wall. The closest parking is seen in the background. I took this picture on Sunday afternoon, so it was not very busy. On weekdays the lot is packed. CVS Coming soon. Just what New Lenox needs. Things don't look too different since the last set of photos. The construction work so far has been "underground", installing new utility lines. The immediate area around the depot has been closed off, which one guy apparently wasn't happy about last weekend. According to NLAHS, the depot would most likely be moved on June 5, 6, or 7, but that has not been finalized yet. 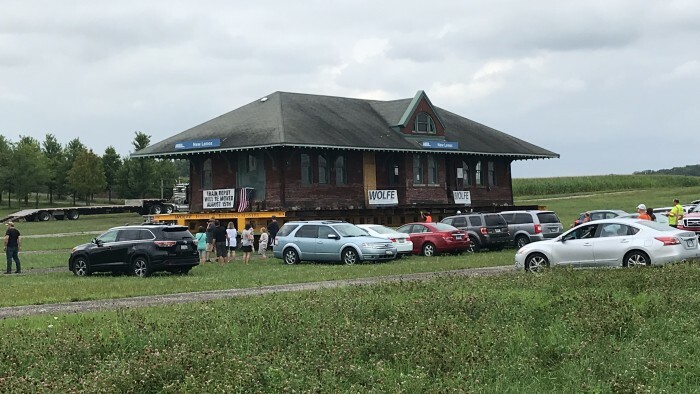 The depot was tentatively scheduled to move some time this week, but there has still not been an official announcement to confirm the date. They have certainly made a lot of progress toward that goal. Some equipment from the moving company (Wolfe House & Building Movers) was staged in the parking lot. They are currently digging under the building to place the beams and supports. The pallets in front of the yellow beams are bricks from the platform. So far they have dug out the sidewalks along the west and south sides of the building and cut a series of holes for the beams to be placed through. No digging along the north and east sides yet, but the platform bricks have been removed. The inside has been stripped of the wall tiles and all the concrete that was below the floor has been removed. This picture was taken through a hole in the west side of the building, below floor level. Note that on the far end you can clearly see how the old baggage door was bricked over. Looking through the window on the opposite side. The interior walls for the restroom, ticket office, and utility room are all gone. They are in the process of digging trenches for the beams that will be placed under the entire structure. Meanwhile, the foundation for CVS is being poured. This week they dug out the remaining north and east sides, placed beams underneath, and wrapped two cables around the entire building that are attached to steel corner protectors. It is starting to look like it is almost ready to move. In just one week they have finished removing the foundation and the entire building has been raised about 3 feet above its former level. At this point they are mostly just waiting for all the parties involved to coordinate a moving date, most likely July 10, 11, or 12. A large box mounted on the south side. Air compressor? I guess that since the RI has been bankrupt for 40 years, nobody cares who uses its logo. Looks like a similar deal to the Don Orseno that IAIS runs on some former CRI&P tracks. 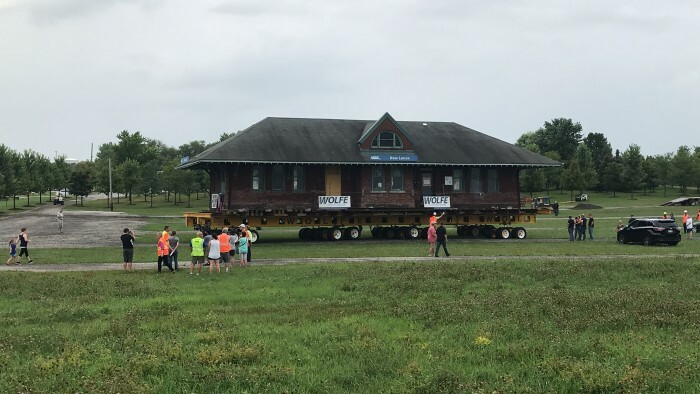 On Tuesday, July 3, the depot was moved away from the tracks and about 150 feet closer to Cedar Road. The steel plates below the wheels shown in the third photo of my last post were placed to assist with this short move. 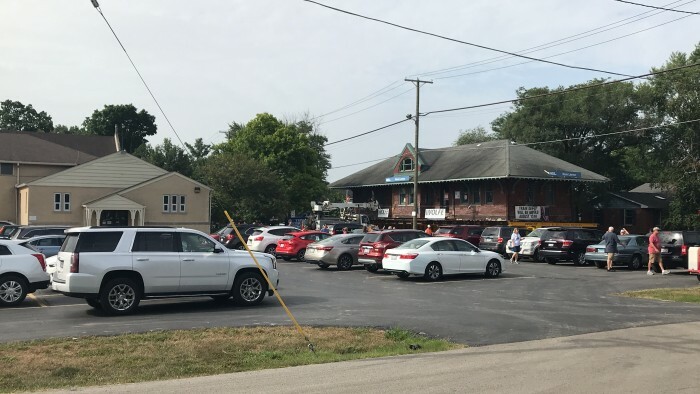 The move to Konow's farm had been scheduled for this Tuesday, July 10, but has been postponed until further notice due to an accumulation of water at the farm. In the last photo, note the gap below the bottom of the "door". Originally the bottom of the brick structure was at ground level. At some point (1964?) the platforms along three sides of the building and the floor inside were raised, which is why the "door" doesn't extend all the way to the bottom of the building. I believe this was done during the same renovation that the baggage door was covered, interior tile was installed, and the restroom was added. 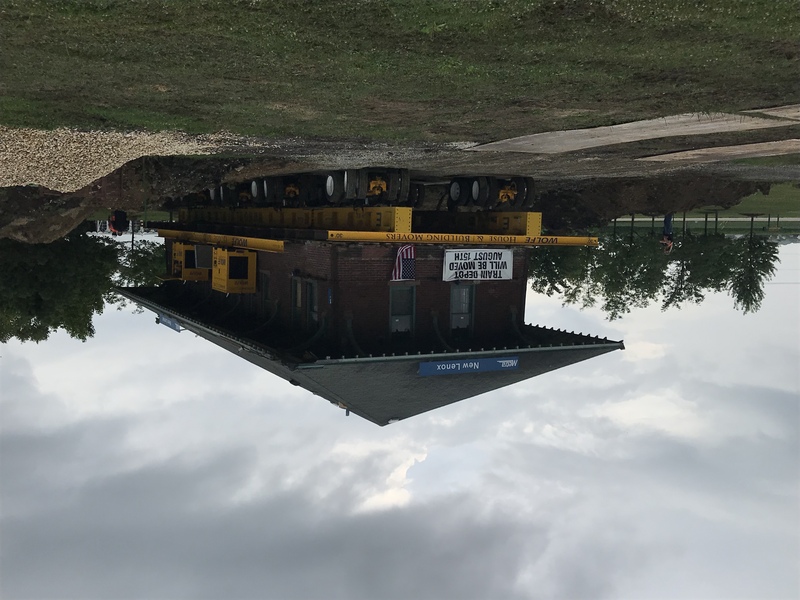 On Tuesday, July 17, the depot was moved to the east of its original location to allow space for the CVS construction. The wheels were removed from the structure so the mover can use them for other projects. A new moving date is expected to be announced soon. I wonder to whom the sign was addressed. 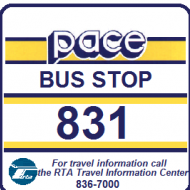 The sign was put up on July 9, the day before the depot was supposed to have been moved. 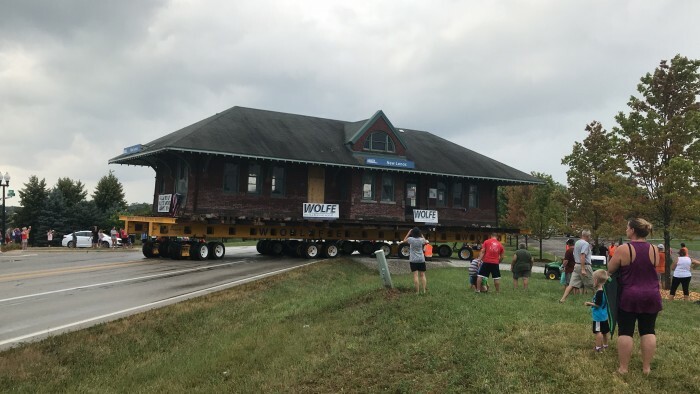 When the delay was announced the previous day, NLAHS made an effort to spread the word quickly so people wouldn't needlessly travel to New Lenox in hopes of witnessing the move. E-Z Sign Company of Mokena donated the sign to NLAHS. Wednesday, August 15 has just been announced as the new moving date. On July 30, water main construction begins along North Cedar Road, which was an additional challenge in determining the moving date. Work will have to be suspended for the day of the move and any obstructions will need to have been cleared in advance. Additionally, ComEd crews will need to be present to raise wires along the route, which in some cases requires power to nearby buildings to be temporarily turned off. Today’s depot move was a success! I took hundreds of pictures and over 90 minutes of video, and I’ll post some on here once I go through them all to find the best ones. A huge thank you to the Konows and everyone at NLAHS for making this happen! Around 7:15, New Lenox Public Works blocked the road to general traffic. There was about an hour delay at this location. The alleged reason was that the wires up ahead provided power to Silver Cross Hospital, which could not have its power supply interrupted. The crew used this break to eat lunch. The depot’s final position in its new home on the farm. In the coming days it will be lowered onto its foundation.